Randy Schellenberg, president of ComforTek, recently released a video for ECRM introducing the Butterfly Table and how it makes education accessible. The Butterfly Table allows students in wheelchairs to share workspace with classmates. 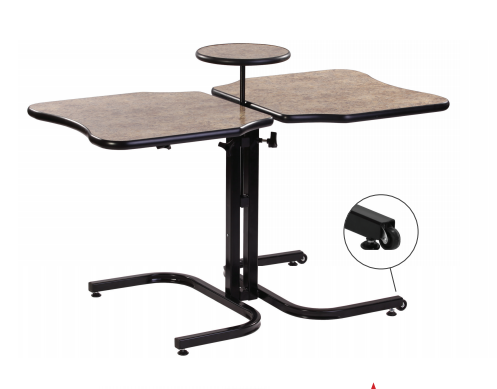 By providing multiple table tops that have an adjustable vertical range of 10″ and that extend outward up to 6″, the Butterfly Table helps students to work at the same space regardless of whether they use a conventional chair or a wheelchair. Because of different chair heights for students and teachers (and teacher aides) in an elementary school setting, the Butterfly Table helps instructors work with students comfortably at the same workspace. The Butterfly Table comes in a 4-person version, too, which works for groups of high school and junior high classmates. Students sit in a circle, which is perfect for facilitating conversation. Plus, because each of the 4 table tops is adjustable, the Butterfly Table can accommodate a combination of wheelchairs and conventional chairs. Here is a video of Randy Schellenberg explaining how the Butterfly Table works in the variety of settings explained above.